WASHINGTON (CN) – President Donald Trump on Wednesday announced his choices for 11 federal judgeships, including one who would replace Justice Neil Gorsuch on the 10th Circuit Court of Appeals. 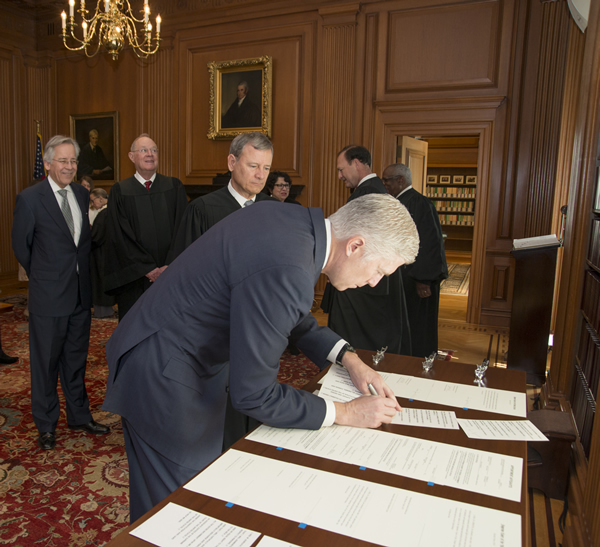 Trump’s selections are his fourth group of nominations to courts across the nation, with the Senate having already confirmed Gorsuch as well as Sixth Circuit Judge Amul Thapar to their positions. Trump tapped current Colorado Supreme Court Justice Allison Eid to fill Gorsuch’s vacant spot on the 10th Circuit. Eid was appointed to the court in 2006 and kept her seat in 2008, with more than 74 percent of Colorado voters voting to retain her. Like many of Trump’s recent judicial appointments, Eid was on the shortlist of possible Supreme Court nominees Trump released during the presidential campaign. Eid clerked for Justice Clarence Thomas and before taking a seat on the bench was an attorney with the firm Arnold Porter and taught at the University of Colorado School of Law. Trump also announced three selections for the U.S. District Court for the District of Columbia, where many lawsuits against federal agencies originate. None of the three currently serve as judges, but all spent time as assistant U.S. attorneys. Dabney Friedrich most recently served on the United States Sentencing Commission, having previously been an associate counsel to President George W. Bush and chief crime counsel to Sen. Orrin Hatch, R-Utah. Timothy Kelly, another of the picks for the D.C. federal court, currently serves as chief counsel for national security and senior crime counsel to Sen. Chuck Grassley, the chairman of the Senate Judiciary Committee. The third pick for the court is Trevor McFadden, the current deputy assistant attorney general at the Department of Justice’s criminal division and a former police officer in Fairfax County, Virginia, just outside of Washington. All of the nominations will go to the Senate Judiciary Committee, which will consider them along with the eight Trump submitted last month.